Some affected families are eager to return, to pray for their loved ones and for their own safety. But others can’t fathom returning to their place of worship – the memories are too raw. He wants to link hands with others and stand watch outside Al Noor Mosque – and more than 2500 others on his Facebook page are keen to join him. “We are together if anything happens. Our main motive is to make a wall around, a human shield you could say, around the mosque,” Mr Saggar said. 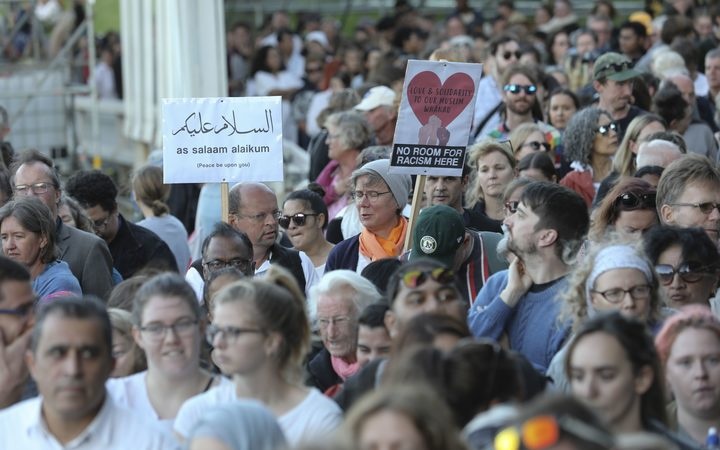 Away from Christchurch the response has been the same, with Lachlan Mackay expecting big crowds for afternoon prayer at Kilbirnie’s mosque, in Wellington. “It’s a powerful symbol, and it’s been done across Europe and the States when we’ve had previous incidents like these,” Mr Mackay said. “Communities, different faiths and ethnic communities, come together and form a human chain to protect a place of worship. Joining Mr Mackay outside the Kilbirnie mosque will be Wellington’s senior Catholic clergyman, Cardinal John Dew. “We want to say that people of all faiths should be able to unite and care for one another,” Cardinal Dew said. “I think the main thing is that people just wear them as they go about their normal day,” Ms Robertson said. “There are some events happening on Friday where people are standing outside the mosque, and I imagine people will wear them there. “There is a desire to show support to the Muslim community as they return to mosques, particularly on Friday,” Ms Ardern said. “There is also a desire amongst New Zealanders to mark the week that has past since the terrorist attack. The man responsible for Friday’s horrific attacks failed in his goal to divide the nation. “You can see we are becoming stronger. Whatever his motive was, we are coming together to say, that is not New Zealand.